New York Fashion Week brought us a multitude of pastels and metallic pieces. Whether it was the sets or the clothes of NYFW that made you feel like you were looking into a new plane of fearless fashion, there’s no question that the runway brought us some daring, otherworldly looks. Though they appear to exist on two completely different points in the aesthetic spectrum, gentle pastels and eye-catching metallics do have something in common: they can add character to any outfit. Pastels can soften your look and help you mix patterns, while adding a holographic touch to your everyday sweater-and-jeans combo can completely change the feel of your basics. The pastels and metallics featured at NYFW gave me very fanciful vibes, as the runways displayed outfits that you might encounter in a different realm. So, if you’re thinking of adding a hint of magic to your closet and want some guidance, there’s no need to wish for a fairy godmother (not that we don’t already want one! 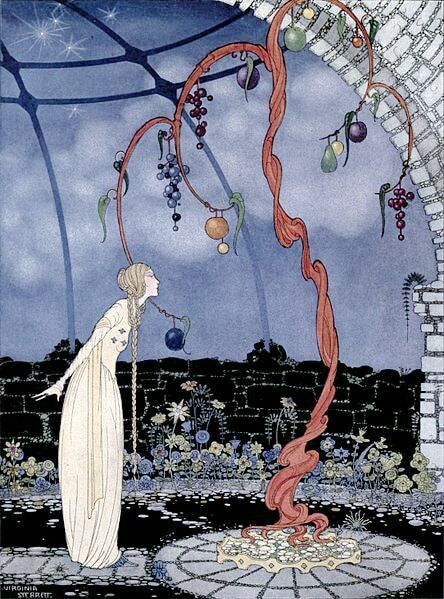 ): This week’s Fashion Inspired by Art post features the work of Virginia Frances Sterrett, and one of her illustrations for a book of fairy tales. One of Virginia Frances Sterrett’s illustrations for Old French Fairy Tales (1920) via Wikimedia Commons. If you’re wondering how you can seamlessly embed not just one, but both of the aforementioned trends into your outfit, let College Fashion be your magic mirror. No poison apples here — I promise! Read on to learn more about Sterrett, and to see three outfits inspired by her imaginative illustration. American artist Virginia Frances Sterrett (1900-1931) accepted her first commission from Penn Publishing Company at only 19 years old. 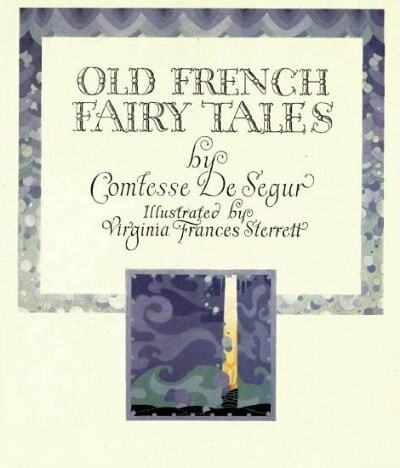 She provided illustrations for a collection of stories, Comtesse de Ségur’s Old French Fairy Tales (1920). In the following year, Penn Publishing Company released another collection of Sterrett’s work, titled Tanglewood Tales (1921). Due to her poor health, Sterrett was only able to complete one more commission before she died of tuberculosis: a series of works depicting her own take on the Arabian Nights tales, for which she is best known. You can view more of Sterrett’s drawings here. Her creations, marveled for the delicate beauty with which she presented these stories, were especially inspiring to me in the sense that her vision was so ornate. Whether it be through the act of daydream, the stories I’m drawn to, or what I look to for inspiration, looking through Sterrett’s work had me realize that perhaps I haven’t grown out of my fanciful side after all. If you’re not quite ready to come to class completely decked out in metallics, but still want to rock that entrance, shiny accessories do the trick. Accessories are a great way to ease runway favorites into your everyday wardrobe. The neutral coat and muted colors in this first outfit balance the statement bag and shoes. Certain shades of purple and blue add some dreaminess to your look. And with some cute moon-shaped earrings, your fashion smarts will go beyond cloud nine. If the metallic shoes and holographic bag duo is a tad too much for you, try these pastel flats with a metallic accent instead – you’ll still get to shine without having to sacrifice any of that shimmer. Alternatively, if you just can’t get enough gleam, why not add a cute scarf with metallic stripes? Dainty outfit two is perfect for catching up with friends at the end of the week. Not only does this Forever 21 bag channel what was recently on the runway, but it’s also super versatile – it can function as a cosmetics bag, pencil case, or even as a clutch for those lighter days. The bag’s watercolor-like design helps add some life to your outfit without upstaging another key piece: the shiny mint shoes. With these, you’ll have a sleek sparkle in your step that even Cinderella and Dorothy would envy. Want to stay a bit warmer? Slip on some socks over your tights – you can do this a variety of ways. You can also wear skinny jeans with this outfit if it’s particularly cold where you are, since the dress is just the right length. If it’s your feet you’re worried about, try these metal Chelsea boots. If you’re still in the mood for an extra metallic touch, you can save at least one of your three magic wishes, because Essie already has a great line of mirror metallic polishes. More of a pastels person? Essie’s got plenty of those for you, too. This last outfit set couples a variety of textures and designs that all work together to help you feel your most luxurious, even on days where you don’t have a lot on your agenda. Whether you’re making a trip to the library or relaxing at the nearby cafe, this ensemble carries with it a flair worthy of its own fairy tale. The floral shoes mesh well with the rest of the outfit – even with that head-turning sequin skirt – because of its medley of quieter colors. If you ever find yourself having trouble when it comes to mixing pieces within this trend, try wearing similar pastels with different fabrics, textured metallics with neutrals, or consult our color combinations tag. The knit sweater and fluffy cardigan keep you cozy, and the gold earrings will have you feeling glamorous from head to toe. You’ll be the talk of the kingdom. Trying to translate daunting runway releases into more practical outfits reminded me that it’s 100% okay to feel intimidated – even confused – by showy, high-end couture. Rather than strutting across campus in direct imitation of this season’s most memorable looks (I mean, could you imagine walking into lecture wearing this? ), take baby steps. Try channeling the outfit by limiting your homage first to certain pieces, such as accessories, and building up from there until you reach your desired outcome. Just as you (probably) wouldn’t waltz into astronomy lab wearing this drapey ball gown from Sterrett’s illustration, take note of its qualities that you like, and see how you can introduce them to your wardrobe. Giant veils and tiaras? Maybe not. But sheer fabric and embellished headbands? Why not! And if there’s something that never quite leaves my mind while writing for this column, it’s that drawing inspiration from more than one place yields fantastic results. For example, you may covet looks presented by your favorite designers, and you might also like to draw inspiration from your favorite stories, films, and music. Now put them together, and see all the different options you have in making your fantasy outfit a reality! 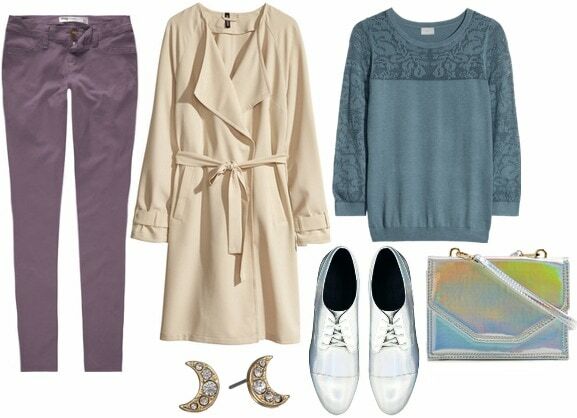 Are you a fan of the pastels and holographic trend? Have you ever looked to your favorite fairy tales for outfit inspiration? Which of these outfits do you like the most? I‘d love to hear your input in the comments section below!